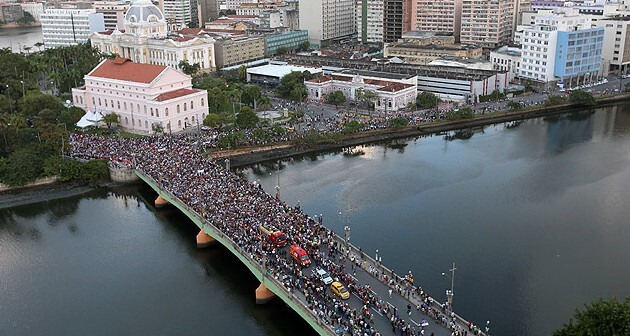 SÃO PAULO — An open-air funeral service for Brazilian presidential candidate Eduardo Campos drew over 100,000 people onto the streets of the northeastern city of Recife, capital of the Pernambuco state, on Sunday, local media say. Archbishop Dom Fernando Saburido led the public mass service as thousands filed past Campos’s coffin in the gubernatorial Princesses’ Field Palace, where he lay in state along with two members of his entourage who also perished in Wednesday’s plane crash. In a highly-politicised event, dozens of senior politicians from across the political spectrum headed to Recife to pay their final respects to the former Pernambuco state governor, including his two main rivals for the presidency, the incumbent president, Dilma Rousseff, and Minas Gerais senator Aécio Neves. Members of the crowd, including Campos’s two eldest sons, shouted “Eduardo, warrior of the Brazilian people,” a reference to the family’s fight against the country’s 1964-1985 military dictatorship. Onlookers could be seen weeping and praying, with flags and T-shirts emblazoned with a phrase uttered by Campos in his final major television interview: Não vamos desistir do Brasil, meaning “We won’t give up on Brazil”. A cortège with Campos’s coffin will be taken through the streets of Recife later Sunday, to a cemetery where he will be buried in the family plot next to his grandfather, Miguel Arraes, who was also both a famous politician and governor of Pernambuco state. Many politicians, including Rousseff, said Brazil had lost a great citizen and political force, and signalled Campos could have become president in the future. Campos had been running for president in the October general elections as candidate for the Brazilian Socialist Party, known by the initials PSB, alongside famous former environment minister Marina Silva, who came on board as running mate after she failed to register her own party, the Sustainability Network. The first round of the election is set for 5 October. The PSB said it would meet to discuss the party’s new presidential and vice presidential candidates this coming week, with a public announcement due on Wednesday. However, various party sources quoted by local media say both the party and Silva have already agreed she will lead their campaign, despite long-standing friction with some members of the party. “If the party agrees, Marina is available to be the candidate,” PSB president Roberto Amaral told Folha, adding that Silva would lend a “continuity” to the party’s bid for the presidency. Silva has already proven to be a strong presidential candidate, coming third in the 2010 general elections with nearly 20 percent of the vote. It has still to be seen how voters will react to Silva, a divisive figure politically, but she is likely lure younger, Evangelical and environmentalist voters away from both Rousseff and Neves. The results of a fresh Datafolha poll of voter intentions are expected on Monday. The previous poll, conducted mid-July, showed Rousseff had around 36 percent of support, with Neves on 20 percent and Campos on eight percent — meaning a runoff would be likely. Some commentators have suggested Silva’s entry into the race will put considerable pressure on Neves and potentially even overtake him, to force a Rousseff-Silva runoff on 26 October. It is understood that no one has yet been tapped for the vice presidential position: PSB deputy Beto Albuquerque is considered by some as the frontrunner, but other options could include Campos’s widow, Renata Campos, who has played a significant role in his political career. Eduardo Campos, four members of his election campaign and two pilots were killed when the private jet they were traveling in from Rio de Janeiro to Guarujá air base crashed on Wednesday morning in Santos, a coastal city in São Paulo state, after attempting to land in poor weather. No one was killed on the ground, although 18 buildings are now known to have been damaged in the crash, which hit a densely-populated, residential area of the city. Crash investigators, including a team from the U.S., are still trying to piece together exactly what happened after the plane aborted its landing. Some eyewitnesses say the plane was already on fire when it hit the ground. It has been revealed that the audio recovered from the plane’s black boxes did not correspond to the flight in which it crashed. Campos was 49 and leaves behind five children, the eldest aged 20 and the youngest just seven months old.